The Lost Queen was one of four regional sovereign hunts published in August 2001. Set in Yorkshire, The Lost Queen was written by newsletter editor, Brian Souter and tells the tale of a famous battle in which the queens on opposing sides fought bravely but both were lost. The King on one site despatches his trusty knight to retrace his steps and find his lost queen. In November 2001, Mike Smith (pictured left) uncovered a fake log - with the lost queen lying snugly inside a cavity - from the base of a tree planted in a wooded park in North Yorkshire. 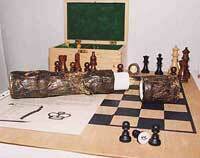 But Mikey returned the log which still contained eight pawns - for other to find. Mikey has written about his exploits on his website. On Good Friday 2001, Nick Perry and his younger brother and sister (pictured) went to the same location - as discovered by Matt Edwards (with some good help early on from Paul Harkin) and claimed one of the eight remaining pawns on Matt's behalf. 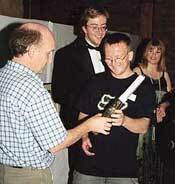 Nick Ball and Jim Moran solved the enigma too, and claimed the second and third pawns on 22 June 2002. The hunt is now closed, and the log was hidden at SE 225 443 in the roots of a large tree, sixteen paces behind the Memorial Stone in Chevin Forest Park, in Otley, Yorkshire. The log was presented to Mike Smith by Brian Souter at the 2002 Annual Meeiting in Stony Stratford (pictured) and the full solution will appear in the October 2002 newsletter (issue 64).